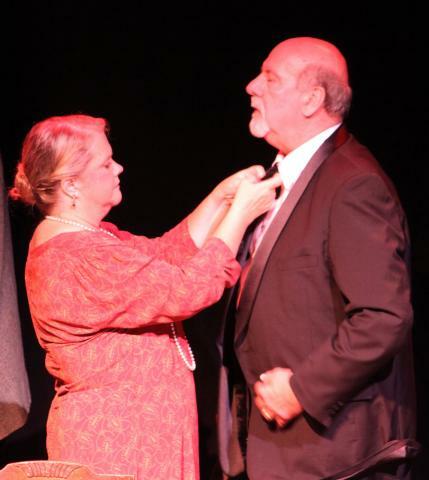 Saybrook Stage performed Encahnted April from July 18th through July 21st to a full house for each performance. Enchanted April was a 2003 Tony Award Nominee for Best Play and won the 2003 John Gassner Award for Outstanding New American Play. The Play premiered in Connecticut at Hartford Stage Company prior to its Broadway debut. This fast-paced light-hearted comedy will have you laughing out loud at some of the crazy things the women and their husbands experience to help them rediscover themselves and the meaning of love. We invite you to travel along with two housewives who uncharacteristically rent a villa in Italy for an impulsive holiday away from their otherwise mundane lives. To help defray the cost of their venture, they reluctantly recruit a pair of independent upper-class women to share the experience. There among the beauty of the Mediterranean coastline, the four women clash - and then begin to blossom - rediscovering themselves in ways that they never imagined.